This page provides summaries and links to my coding projects and exercies. Sometimes it is really helpful to host a short, executable python code on a public web server. You may have a client with whom you wish to share an idea or a methodology. It may not be enough to show a static html page. Amazon's Lambda makes that easy to do. You can customize python library access with "layers." I will post a demo using the Ubuntu Linux OS base machine and a Jupyter notebook running Python 3, and import numpy, pandas, matplotlib, and a few other popular data science libraries. I will post exercises using NumPy and Pandas to manipulate input data. Then, I will use MatPlotLib and Seaborn to visually explore those data. File read/write for JSON, CSV, and Excel formats will be covered. 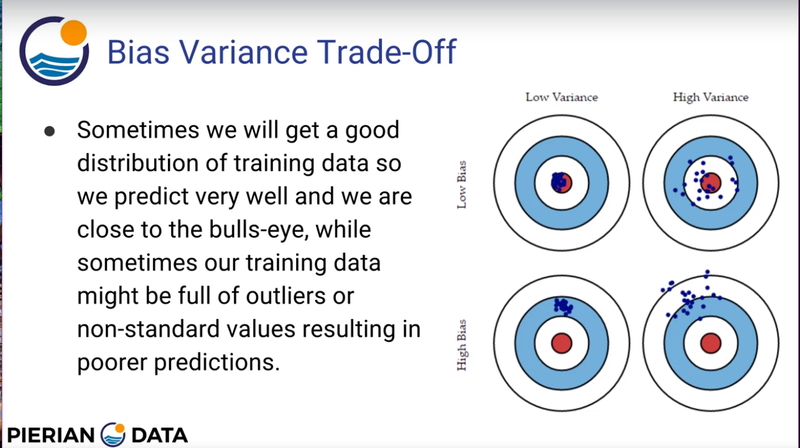 A picture showing conceptually the bias-variance tradeoff in machine learning. Source: Pierian Data, Udemy class PyMLDSBC, Section 16 link. Udemy class link. Passenger information from the Titanic ship is a common data set used in machine learning (ML). Here I use Python and data science libraries to find patterns in the data and build a prediction model. Then I use various visualization libraries to create pretty figures. Data: https://www.kaggle.com/c/titanic/data: Kaggle Titanic data. Reference: Rossant, Cyrille, Ipython Interactive Computing and Visualization Cookbook, 2nd ed., Packt Publishing 2018, pp. 299-304. Algorithm efficiency is studied using the Big-O math. Generally an oder of log(n) is preferred over an order of n*log(n), n**3, or n!. The best algorithm has an order of n, O(n), but this is rarely achieved. An O(n) means that as the number of inputs grows, the time to execute grows linearly. In my sorting algorithm, I use a binary tree with a central pivot point and recursive function calls to itself. I use this algorithm to study Big-O math. Example to post. Functions - *arg, **kwargs, defaults, and variables order. To do. Class Objects - Spaceship Class, Asteroid Class. To do.